Aleks2cv made this comment on my long post about the West London Orbital Railway, which was entitled New Railway Line For West London Proposed. West London’s version of Goblin, an available resource with potential. All urban London so suitable for Overground 4 car metro service. I would add extensions to your outline. There is space at the former Midland Finchley Road station for a single terminating platform with existing street facade. Interchange with North London, Metropolitan, and Jubilee and coaches on Finchley Road such as Stansted AirLink. This is only part of the comment and I’ll deal with the rest after Christmas, if I renmember. 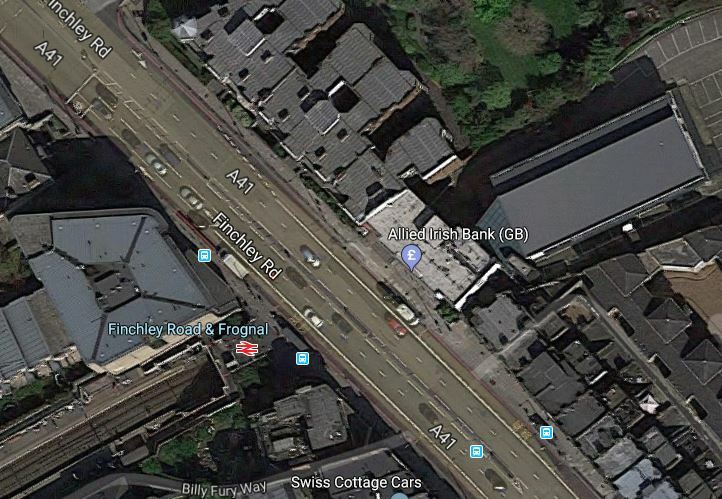 This is a Google Map of the area along the Finchley Road, between Finchley Road and Frognal station in the North and Finchley Road station in the South. It is one of those interchanges, you might do in a North to South direction, as you have gravity assistance. This second map from carto.metro.free.fr shows the various rail lines. Note, the following lines can be seen in both maps. The Midland Main Line through West Hampstead Thameslink station, which crosses Finchley Road between Finchley Road and Frognal and Finchley Road stations. The Metropolitan and Jubilee Lines going through West Hampstead and Finchley Road stations. The North London Line going through West Hampstead and Finchley Road and Frognal stations. I took these pictures as I walked down Finchley Road. My thoughts on various parts of the area. The station is a very poor example. There is no step-free access. There is a ruin next door. There is a need for perhaps a light-controlled crossing outside the station, as the road is very busy. Improvement wouldn’t be helped, by the fact that the station is at the end of Hampstead Heath tunnel. This Google Map shows a close-up of the station. The only solution is probably a full rebuilding with perhaps a block of housing or offices on the top of a modern station. This Google Map shows the Midland Main Line as it passes under Finchley Road, to the North of the O2 Centre. There is not much space between the railway and the service road for the O2 Centre. The large surface-level car park of the O2 Centre is visible. The two slow lines are the Northern pair of lines, with the two fast lines to the South. At least there is space in the middle of the lines. Aleks2cv in his comment, felt that the West London Orbital Railway can be extended to Finchley Road. I think this could be very difficult, as the West London Orbital Railway will probably be a single track railway sneaking up the South side of the Midland Main Line. There is very little space. Passengers would still have to walk about a hundred metres to connect to the Underground. Connecting to the Overground would require a stiff walk up the hill. 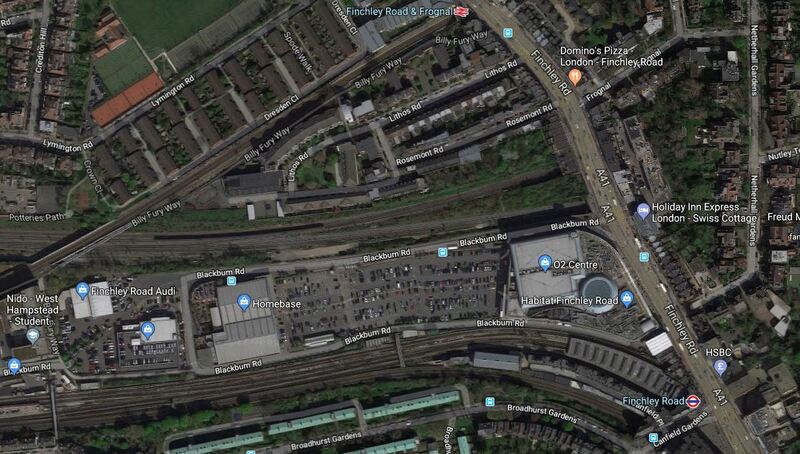 This Google Map shows the limit of the freight line, that could possibly be turned into the West London Orbital Railway. The railway going East-West is the Midland Main Line. The diagonal railway is the North London Line through West Hampstead station. In the shadows on the South side of the Midland Main Line, you can just see tyhe freight line, which connects to the Down Fast of the Midland Main Line to the East of the bridge. It looks to me, that years ago, the land now occupied by the O2 Centre was some form of railway yard or factory premises. Finchley Road Underground station is a station in need of a degree of refurbishment. Pedestrian access to the O2 Centre is not good. But it is a cross-platform interchange between the Jubilee and Metropolitan Lines. The two Chiltern tracks to the South of the station. The closeness of the Western end of the station to the Car Park of the O2 Centre. There is space to the South of the Chiltern tracks. I feel very much that this station could be developed sympathetically to be a very good station, that could be paid for by housing on the top. I think the O2 Centre could be the key to Aleks2cv’s idea for the West London Orbital Railway. The O2 Centre appears tired. Public transport can take people easily to the shopping at Oxford Street or Brent Cross. Surface car parking is so Twentieth Century. As the O2 Centre is owned by British Land, who are one of the UK’s biggest property companies, I think that it is likely the site could be redeveloped. Suppose the site was developed as follows. It extended over and connected to the Western ends of the platforms at Finchley Road Underground station. A two-platform terminal station for the West London Orbital Railway could probably be fitted in reasonably close to the Underground station. Over the top would be shops, offices, housing or whatever was desired. I believe that something will be done to redevelop this site. Whether it has the terminal for the West London Orbital Railway underneath, will only be made clear, when planning permissio is given. This takes me back to my childhood. From being about 6 or 7 we used to go to stay with my aunt and her friend, who was an honorary aunt, in Finchley for a week in the summer. We used the tube a lot, although mostly we used Golders Green Station, – they lived in Stanmore Avenue. And when we didnt use the tube, we walked places a lot. I used to love going, and Margaret, the honorary aunt, would take me to the park each morning whilst my aunt and my mother made lunch – either a picnic to take somewhere, or something to eat at their house before we went out in the afternoon. The park was great, and auntie Margaret used to come on the slide and the swings and suchlike with me, which my parents never did. Sadly she died when my eldest daughter was about 4, so my girls don’t have the memories I have.